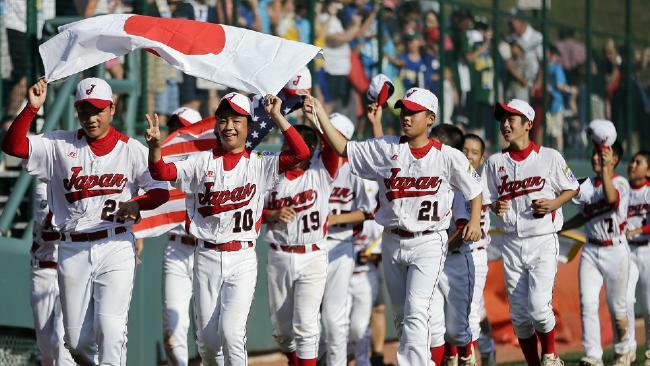 SOUTH WILLIAMSPORT, Pa. - Noriatsu Osaka hit three homers and tripled, and Japan limited Tennessee's potent lineup to two hits in a 12-2 victory Sunday in the Little League World Series title game. Starter Kotaro Kiyomiya struck out eight in four innings and added an RBI single for the boys from Tokyo. The game ended in the fifth after Osaka's third homer made it a 10-run game. A day after pounding out a 24-16 win over California in the U.S. title game, the Goodlettsville, Tenn., sluggers could only muster two hits — solo homers by Brock Myers and Lorenzo Butler. The teams exchanged the customary postgame handshakes at the plate before Japan received the World Series championship banner. Japan slugged five homers Sunday, including Rintaro Hirano's three-run shot to make it 10-1 in the fourth. Tennessee lost a 10-run lead in the bottom of the sixth before scoring nine times the next inning to finally put away Petaluma in a Little League classic. Even more impressively, Butler had three homers and a record nine RBIs — a feat so unique the 12-year-old's name became a trending topic on Twitter. Its pitching depth sapped, Tennessee turned to right-hander Justin Smith to start against Japan - the first time the 12-year-old had started in the World Series or in Southeast regional tournament. Leadoff hitter Osaka didn't waste any time with a first-pitch triple to right-field corner in the first. Kiyomiya delivered his RBI single two batters later to get the scoring started.